Over the weekend the Rockport Fire Department was called by a well-meaning person because they thought Mr. Swan was stuck in the ice. Believe me when I write that Mr. Swan has spent the last 29 years of his life (at least 29 years) on Cape Ann’s wintry waterways. 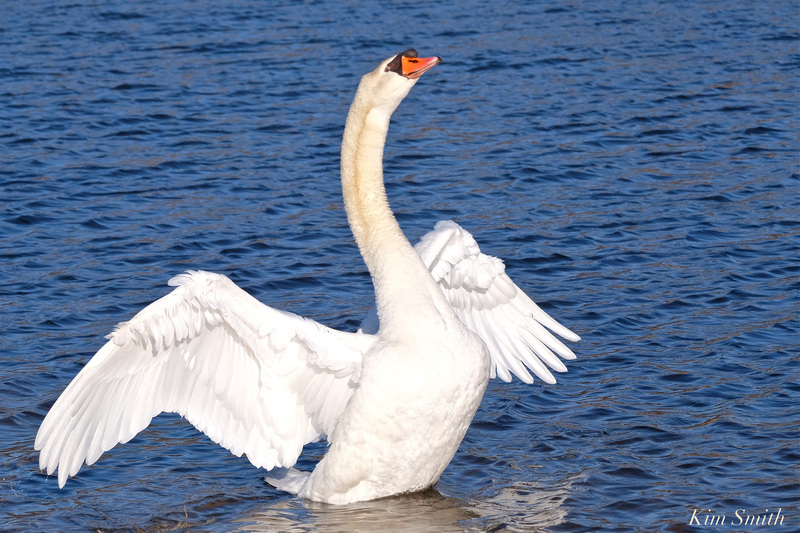 If Mr. Swan finds himself partially frozen in the ice he uses his mighty breast to break up the ice by lifting his body out of the water and then coming down hard, pounding the ice with his chest. We have seen him do this powerful move dozens of times. 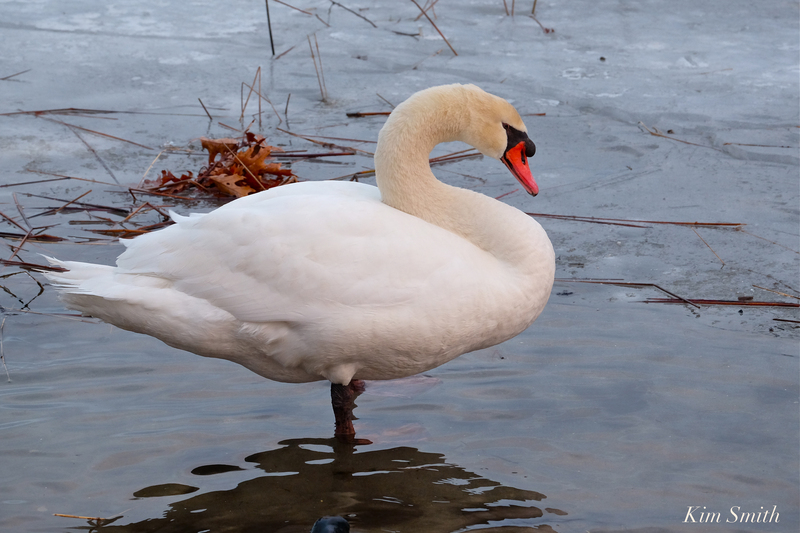 Notice Mr. Swan’s large and well-defined breast bones, which are ideal for breaking up ice. There was a concern last year about him being unable to get off ice he had unwittingly flown onto, only because he had an injured foot. With his bad foot, he could not get a running start to take off flying. Mr. Swan’s foot has healed and he is doing beautifully. It is of grave concern when the local authorities are called regarding Mr. Swan. We are afraid that the case will be referred to Mass Wildlife. Mute Swans are considered an invasive species and it is not part of their protocol to save non-native species of wildlife. As he is a “community” pet, some leeway may be permitted, but that is not guaranteed. Please contact me at kimsmithdesigns@hotmail.com. When you contact me about any issues regarding Mr. Swan, I in turn contact and discuss with his longtime caretakers and friends Lois and Serena, Lyn, Skip, Joel and Skip, Elaine, and Jodi and Erin at Cape Ann Wildlife. It was a terrible ordeal last time there was an attempt to capture Mr. Swan. We don’t want him to go through that kind of trauma ever again, especially at his age. During the winter months, Mr. Swan’s territory expands tremendously and it includes the length of the Annisquam River and all inlets, all along the backshore from Rockport Harbor to Gloucester Harbor, and all the fresh bodies of water in between. Please let people know and share this post with everyone you know who may have contact with Mr. Swan. This entry was posted in Birds, Birds of New England, Life at the Edge of the Sea, Swans (Cygnus olor) and tagged Beautiful Birds of Cape Ann, beautiful Birds of Massachusetts, Cygnus immutabilis, Cygnus olor, Friends of Mr. Swan, Ice, Mr. Swan on January 15, 2019 by Kim Smith.